The Kaliningrad Region Development Corporation assumed this role. It will become a “single window” for promotion, search of investors and counseling on all private and public industrial sites in the region. This was announced on the 20th of March at the round table by the leaders of the Corporation and the management companies of industrial parks: ECOBALTIC, Khrabrovo, Chernyakhovsk, Stahlwerk, Ostmark, and Lesobalt. “Our main task is to attract investors and localize productions in the Kaliningrad Region. Therefore, it is necessary to join efforts when it comes to promotion, methodology of work with investors, interaction with the regional government and regulatory authorities. There is a logic for the Development Corporation to be a “single window”, a platform for the discussion of existing issues and best practices,” Andrei Tolmachyov, Director General of the Development Corporation, said. Such work is already carried out. During the recent visit of Dmitry Kozak, Deputy Prime Minister of the Russian Federation, the Corporation introduced all regional parks in one presentation, showing their specialization, opportunities, and prospects. Equitable support of the work of industrial parks by profile institutions of the Kaliningrad Region. Fair involvement of state and private industrial parks in thematic exhibitions and business missions held jointly with the government of the Kaliningrad Region (taking into account specialization of each industrial site). Working on joint projects, meetings and business missions with the Kaliningrad Chamber of Commerce and Industry and the Russian Union of Industrialists and Businessmen. Organization of interaction between the industrial parks and the Kaliningrad Region Development Corporation in a “single window” mode in terms of the use of existing efficient compensation mechanisms and other support government incentives proposed by the government of the Kaliningrad Region. Development of effective mechanisms aimed to increase the number of winners among Kaliningrad industrial parks in federal competitions for compensation and subsidies. Development of general rules and equal access of all industrial parks in the region (including state industrial sites) to connect with the strategically important infrastructure networks (electricity, gas, water supply, etc.). Creating a common information field to deal with the problems of industrial parks in the region. Oleg Chernov expressed the hope that the first joint meeting would launch the development of a “road map”, with clear deadlines and responsible persons. Valery Voytyuk, Director of the Baltfarmatsevtika LLC management company, suggested to discuss new laws, standards and rules, that have influence on the activities of industrial parks on a regular basis (once a month or once a quarter). He also claimed the need to form a database on services that could be provided on a mutually beneficial basis by the residents of the industrial parks of the region. According to Mr. Tolmachyov, the Kaliningrad Region Development Corporation plans to continue acting as a platform for discussing issues of infrastructure support, decrease of administrative barriers, tariff regulation policy and government incentives (subsidies, grants). ‘We are also ready to come forward with a consolidated position through introduction of amendments to the state legislation in respect of activities of industrial parks; furthermore, we are planning to assume the function of finding government incentives designated for infrastructure development’, Mr. Tolmachyov said. 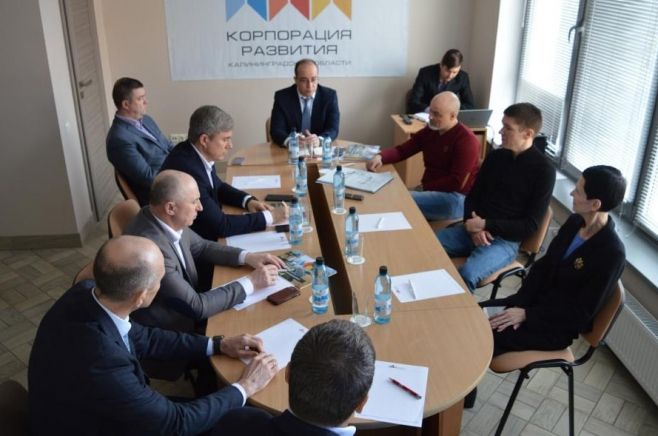 Representatives of the Kaliningrad Region Development Corporation and representatives of the industrial parks of the region have come to agreement on information coordination when preparing for participation in the investment council by the governor of the Kaliningrad Region. There will also be an exchange of plans for the exhibition work and proposals for further cooperation.